“Power Division is making serious efforts to reduce the circular debt and for the purpose. 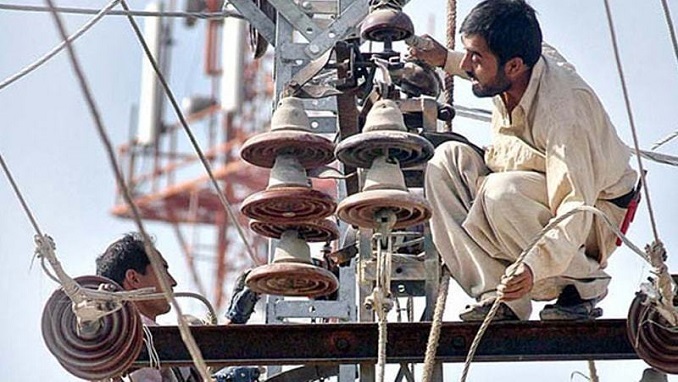 A commercial loan of Rs35.8 billion has been acquired, and to reduce the burden further, the government is in process of obtaining Islamic Financing of around Rs100-200 billion against the assets of Discos and Gencos through Islamic Banking,” said official documents released by the power division here Sunday on the completion of 100 days of the PTI government. Islamic loan against the assets will help by saving late payment surcharges on payments to IPPs. The report further said the present government has launched an Anti-theft campaign and as per directions of the prime minister, a campaign to curb the menace of electricity theft has been launched since October 13. As a first step two task forces – one each in Punjab and KP – were established. From all over the country around 6880 theft cases were detected and 3810 FIRs were requested. However only 1441 cases were registered and 1088 arrests were made and amount of detection bill of Rs 26571528 were charged. The highest numbers of theft cases were unearthed in Punjab. Out of total cases of 5103 in Punjab, it was requested to register 3378 FIRs; however only 1287 cases were registered and 887 people were arrested. An amount of detection bill of Rs 251297525 was charged. In KP, only 676 theft cases were unearthed and 124 FIRs were recommended. All the recommended cases were registered and around 201 people were arrested and amount of detection bill of Rs 6554682 was charged. In Sindh, a total 1078 cases were detected and 308 FIRs were recommended; however only 30 FIRs were registered but no arrest were made. An amount of detection bill of Rs9050764 was charged. In Balochistan only 23 cases were detected but no FIR was registered against any culprit and an amount of detection bill of Rs 668555 was charged. In addition to the anti-theft task forces, Power Division has constituted independent monitoring teams with the mandate to visit the Discos and cater to specific complaints of irregularities and corrupt practices. In the last week of October, the monitoring team was sent to Sepco area who reported massive use of kundas in all of these areas. As a result, three XENs, five SDOs, one line superintendent, one meter reader and one lineman who were found complacent in curbing this menace were suspended. Similarly, monitoring visits have also been conducted in Pesco area and action is being taken against officials/electricity thieves and due to the anti-theft campaign there is a visible decline in the incidents of electricity theft, claimed the report. This can be illustrated by the decrease in line losses by 1.5% during the month of October 2018. Regarding recovery of the outstanding dues, the report said the anti-corruption and anti-theft drive has shown positive effects on recovery of outstanding dues as well and it has shown an increase of one percent. Anti-Theft Technology to Reduce Line Losses is being launched by introducing Aerial Bundle Conductors (ABC) Cable. Aerial Bundled Cable (ABC) can control and preempt illegal connections through direct hooking which can in turn help in controlling the menace of kundas and reducing line losses in high-loss areas. In the first phase it is planned to install ABC in Pesco And Sepco areas and the same will be rolled out in remaining Discos targeting high loss feeders, said the report. For improvement of NTDC system and removing Constraints for Efficient Transmission, Power Division has identified around 40 major areas which need immediate attention. These works/constraints have been divided into three phases (15 Sep 2018 to 15 Dec 2018, 15 Dec 2018 to 31 March 2019 and 01 April 2019 onwards). Progress on five constraints identified in first phase is as under: Chakdara 220KV Grid and Transmission Line has been made operational, Extension work at Mardan 220 KV Grid has been completed, DI Khan 220 KV line has been completed while Grid will be made operational in next 10 days, Reconductoring of Tarbella Burhan Transmission Line is in progress and will be completed during current month. Work on Port Qasim Transmission Line will be started from 26 December 2018 onwards once the plant goes on shutdown. According to the report, long term planning (upto year 2040) for power generation, distribution and transmission is being undertaken to make the system efficient while making the energy competitive and affordable. Regarding the solarisation of agri-tube wells in Balochistan, the report said that there are more than 30,000 tube wells in the province which put a great strain on the entire power sector in the country. The Power Division is in the process of conducting a feasibility study through Nespak on the prospects of conversion of 30000 agriculture tube wells in Balochistan to solar power. NTDC and AEDB will support Nespak in this exercise. Once completed, the study will help the decision makers in firming up a proper strategy for implementing the project. For the improvement of distribution system, short, medium and long-term planning is being done to invest in the 132 KV grid stations improving their capacity by adding power transformers, improving HT to LT ratio to international standards and rationalizing feeder lengths to overcome losses, tripping and overloading. For ensuring uninterrupted supply the repair of transformer is being undertaken. The rate of damage to distribution transformers is quite large and the existing repairing workshops do not have the capacity for timely repairs of these units. Discos have been directed to develop transformer repairing workshops at diversified locations to reduce turnaround time and to increase the availability of standby transformers at the sub-division level, said the report.